The low oil price could increase the risk of environmental accidents in offshore drilling by forcing contractors to cut costs, according to a risk management expert who testified at BP’s Deepwater Horizon trial in the US. Robert Bea, an engineering professor at the University of California, Berkeley, and head of the Deepwater Horizon Study Group, told Unearthed that cost cutting as a result of a low oil price could reduce the incentives for staff working on rigs to follow safety procedures. Major ocean drilling contractors have been put under the cosh by the falling oil price, which has reduced demand for their rigs from oil giants such as Shell and BP – who are also squeezing their exploration costs. As the price of Brent crude – currently about $60 per barrel – has plummeted almost 50% since last June from $115 per barrel, demand for offshore rigs has also dropped. And it isn’t predicted to recover for several months. Two leading offshore contract drilling firms – Transocean, which is the world’s largest offshore drilling operator, and Noble Corp – have both recently had their credit ratings downgraded by some financial analysts. They have also recently posted financial results that show them attempting to ameliorate declining profits by cutting costs. Both contractors – which are providing drilling rigs for Shell’s intended Arctic drilling forays off the coast of Alaska this summer – have had issues as far as environmental safety is involved. Transocean, whose clients include Exxon, Shell, BP and Chevron, was implicated in the Deepwater Horizon disaster. 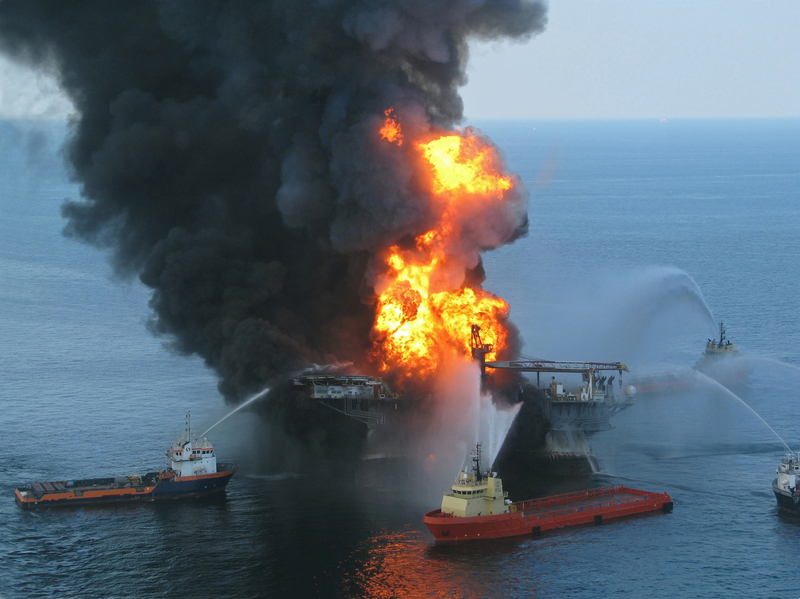 BP was leasing the Deepwater Horizon rig from Transocean in 2010 when there was an explosion on the rig, killing 11 workers, followed by a three-month long oil spill in the Gulf of Mexico. Late last year Noble Corp – whose main client is Shell – paid $12.2 million to settle felony charges brought by the US government related to environmental and safety violations on vessels in the Arctic while working for Shell in 2012. And cost cutting pressures imposed on their clients raise concerns over the increasing likelihood of future problems. In a response to an email from Unearthed, Professor Bea – who worked for Shell in the 1960s and 70s and has worked as a consultant for BP – agreed that cost cutting by rig contractors and their clients could increase the risk of environmental and safety problems in the future – even another environmental disaster like Deepwater Horizon. He explained that “one of the ‘root causes’ of the Deepwater Horizon disaster were the “Every Dollar Counts” incentives” that BP management put in place two years before the disaster – these included incentives for following safety procedures. “Experience has demonstrated that ‘cost cutting’ can result in undesirable reductions in the protections that are needed to be ‘safe’,” Bea said. He added: “In general, the companies do not have a valid and validated way to quantify ‘safe’… it is ‘up to the operator’ to determine what is ‘safe’. Oil majors have had to focus on short term cash-flow over exploration programmes as a result of the low oil price. Shell recently told investors that to “preserve Shell’s financial flexibility” there were opportunities to cut costs, including in their supply chain. This could put additional stress on Noble Corp, in particular, whose main client is Shell, followed by Brazil’s Petrobras. In November last year, Transocean warned that the offshore oil industry faced a downwards spiral as a result of the drop in crude prices. Last month Transocean’s bond rating was downgraded to junk (representing a higher default risk) from investment-grade by ratings agency Moody’s, while Noble Corp’s share rating was cut from hold to sell by analysts The Street. Eight of Transocean’s 29 ultra-deepwater rigs are currently idle, according to the FT. Even more of the firm’s rigs are at a high risk of being idled, stacked or retired, according to an analysis by UBS. The recently posted financial results of Transocean and Noble Corp also suggest challenges ahead. Transocean’s 2014 Q4 (October to December) results from the end of February revealed a slight fall in revenue. But profits were also down from $233 million in the fourth quarter of the previous year to a loss of $739 million in 2014. The company projected diminishing costs and said its capital spending would fall by 30%. Following the release of the results, Deutsche Bank analysts (which has a sell rating on Transocean) urged Transocean to take decisive action to improve liquidity rather than “kicking the can down the road”. Meanwhile, Noble’s stock have hit new 52-week lows of $14.34 early last week, following the publication of its annual report. The firm reported a Q4 loss. It also said it would retire three of its 32 rigs – adding up to a total of 11 floating rigs scrapped by the firm since December. Unearthed has approached Shell, Transocean and Noble Corp for comment, but not received responses. Shell is expected to get the go-ahead by the US government to restart its Arctic drilling this week.